Renowned scholar and activist Professor Anand Teltumbde who was illegally arrested by Pune police in the early hours of February 2, 2019 was released by an order passed by Special Judge K D Vadane in Pune in the early evening of the same day. Teltumbde, who is a writer, scholar and leading Dalit activist, was arrested by Pune Police at about 03:45 a.m. on February 2, 2019 from the Mumbai airport for his “alleged role in Elgaar Parishad violence” (Bhima Koregaon violence case) of January 1, 2018. Despite the Supreme Court by order dated January 14, 2019, having granted protection to Teltumdbe from arrest for four weeks i.e. till February 11, 2019, the Pune police defied the order of the apex court and arrested the esteemed scholar during the wee hours of February 2. It must be noted that Teltumbde, ironically enough, was neither associated with Elgar Parishad, nor was he in support of the “myth of Bhima Koregaon” and that’s the irony that completely escaped Pune police when they arrested the noted professor of data analytics and cultural studies from Mumbai airport on early morning of Saturday. After the shocking arrest of Teltumbde from the Mumbai airport, his lawyer Rohan Nahar moved an application before the Sessions Court seeking action against the Pune police for committing contempt of Supreme Court’s order and holding the remand application illegal. Teltumbde was produced before the Special Judge K D Vadane at around 3:00 p.m. Advocate Nahar submitted to the Court that, from the “order of Hon’ble Apex Court, it is clear that protection offered to the accused, Anand Teltumbde, is in force till February 11, 2019, but police arrested him before completion of the said period of protection”. He further submitted that “rejection of relief under section 498 of the Code of Criminal Procedure by the trial court, would not vitiate and set aside relief granted by Hon’ble Supreme Court”. The Special Public Prosecutor opposing the application contended that after the trial court rejected anticipatory bail filed by Anand Teltumbde and did not pass any order of protection than the protection granted by Hon’ble Supreme Court gets extinguished and the matter would thereafter only be governed by the court of competent jurisdiction. The Special Judge finally ordered that the arrest of Anand Teltumbde is illegal and he should be immediately released. The court also ordered that the illegal action of Pune police amounts to contempt of Supreme Court’s Order. Pune police have been investigating the charges of alleged Maoist involvement in Bhima Koregaon case, during which violent clashes had been witnessed in and around Pune city on January 1, 2018. 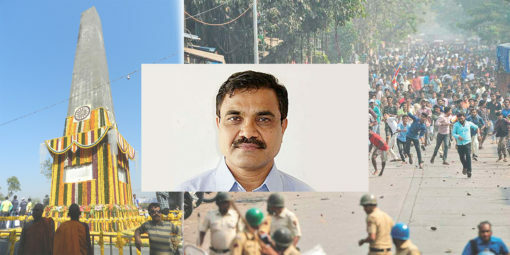 In the aftermath of violence, the Pune police in its desperate action raided the houses of prominent civil rights activists, including Anand Teltumbde. On December 21, 2018, the Bombay High Court dismissed the petition filed by Anand Teltumbde seeking the quashing of the FIR; however, granted him interim protection from arrest for three weeks. "The Special Judge finally ordered that the arrest of Anand Teltumbde was illegal and he should be immediately released. The court also ordered that the illegal action of Pune police amounts to contempt of Supreme Court’s Order." Thereafter, Anand Teltumbde moved Supreme Court seeking the quashing of FIR. On January 14, 2019, a bench comprising Chief Justice of India Ranjan Gogoi and Justices Ashok Bhushan and S K Kaul declined his plea; however, extended the interim protection from arrest granted to Anand Teltumbde by the Bombay High Court to four weeks. The court in its order also said that Anand Teltumbde can seek regular bail from the competent trial court and can avail all options available to him within this period. Anand Teltumbde then applied for anticipatory bail in the city court in Pune. On February 1, 2019, the Special Judge K D Vadane on rejecting the anticipatory bail application had passed an order stating that there was “sufficient material” collected by the investigating officer to prove the allegations against Anand Teltumbde. However, while Anand Teltumbde has protection order till February 11, 2019, the arrest made by the Pune police was illegal and was in gross violation of Supreme Court order, the Special Judge added. The Pune police are guilty of contempt of court for disdaining the order of the apex court, the Special Judge noted. Nishant Sirohi and Nihalsing Rathod contributed to this update.